Young adult readers take a foray into surrealism in this timely fantasy novel that alternates between middle school reality and an imaginary land to comment on contemporary themes and explore a common teen problem. 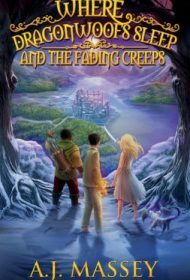 Each night, when they fall asleep, three misfit 13-year-olds—Avery, an orphan in a group home; Marcus, a self-conscious, overweight, home-schooled boy; and Ben, who neither fits in with the popular kids nor the “nerds”—find themselves simultaneously in Meridia, a fantastical land. Likewise, when the trio falls asleep in Meridia, they wake to their normal teen lives. Binding the three disparate dreamers is that they are all bullying victims. Meridia is a land of contradictions: Snow is hot; fairies are cannibalistic harpies; night and day change instantaneously; and time is speeding up. Here, Avery, Ben and Marcus unite with three miniature dragons and two brave elves to embark on an important quest: Meridia is gradually disappearing, and the plucky band of heroes must fight monsters and magic to keep the land from fading away. Dragonwoofs suffers slightly from stereotyping. While one of the popular girls is friendly to Avery, the others are quintessential “mean girls” who treat her as a pariah; all the “jocks” are bullies or their confederates. The main characters, however, are charismatic and believable, and the book succeeds on other fronts, as well. This is a quick read; transitions between reality and the dream world are smooth; and the use of several viewpoints is never confusing. Without being pedantic, author A.J. Massey helps his YA readers examine other topics besides bullying, including racial diversity, addiction and violence. Massey’s Meridia is not quite as fully imagined as Tolkien’s Middle Earth or Terry Brooks’ Shannara, largely because this is a relatively short work. However, the world is unique and memorable— a destination well worth revisiting in possible sequels.